Some years ago Michael Poynder introduced me to a book by Hamish Miller & Paul Broadhurst, called ‘The Sun and the Serpent’ about the Ley lines of Europe. I was totally engrossed by the book and taken by the fascinating re-discovery of the Michael and Mary Ley lines in England. I eagerly awaited the arrival of the next book called ‘The Dance of the Dragon’ which covered the re-discovery of the Apollo and Athena Ley lines, going from Ireland, through Cornwall, France, Italy, Greece and on to Armagedon in Israel. Coincidentally, shortly after I finished reading the second book, Anthony Wong did a presentation at the Society about his travels to the Pilgrim sites of Europe. The connection between the two was stunning and this prompted me to ask Anthony for permission to use and modify his presentation to form the basis of a new presentation focused on Dowsing, thus was born ‘Exploring the Ley Lines of Europe’. This was three years ago, and I had no first hand experience of the Ley lines. 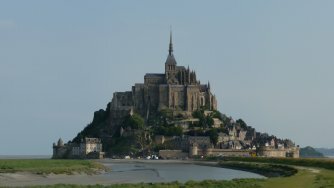 So my wife and I decided take the opportunity of a visit to my parents in Paris to visit Mont Saint Michel in Brittan, and get acquainted with the Ley line energy. Mont Saint Michel is one of the main pilgrimage sites in France, with Chartres and Vezelay, and the location of a major crossing of the Apollo and Athena Ley lines. Mont Saint Michel is a unique site, originally built on a pyramidal rock, located in the middle of a deep forest. In the 8th century the sea bed collapsed and the mount became an island. The Archangel Michael himself prompted the construction of the first chapel. He appeared to a monk called Auber, requesting him to build a shrine on the side of the rock, near the top. Auber flately refused. A second request by the Archangel was also rejected by Auber. At the third request, Auber foolishly asked for a sign. In response, the Archangel poked a hole in his skull with his finger. Auber did get the message that time and promptly built a small chapel on the mount at the exact location of the crossing of the Apollo and Athena Ley lines. Auber eventually became the Archbishop of a nearby town called Avranches. 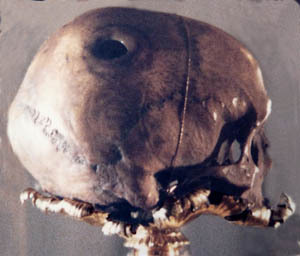 His skull can be seen today in a glass relicary, in the church of Avranches. The hole in his skull is clearly visible as you can see on the photo. Over the years, building on the mount increased, so much so, that the location of the original chapel was lost, buried under other churches. It was rediscovered in recent times. Visiting this original chapel was high on our list of things to explore. Driving from Paris is easy, an expressway links Paris directly to Avranches in less than 4 hours, much less if you drive as the French do. The mount is visible from quite a distance, spectacular amidst fields of salty grass, grazed by herds of black headed sheep. Getting closer, one becomes aware of the powerful energy emanating from the mount. The tides are some of the highest in the world. The sea retreats up to 18 kilometres away at low tide. It comes back up at high speed. The high tide is sometimes up to 14 metres higher than the low tide. On the mount is a small, very well preserved, medieval town filled with pilgrims and tourists from all over the world. A single very narrow street winds up to the top where the entrance of the abbey is located. But our immediate interest was to get acquainted with the Ley lines. According to the book, the Athena line runs across the fortified walls, close to the entrance of the town. 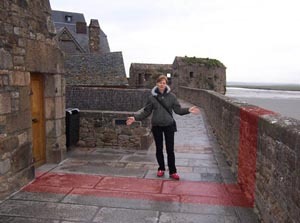 Dowsing rods at the ready, I scan the walkway at the top of the wall…. Nothing, OK, I ask “Show me the Athena Ley line”, no response, nothing. But it is there. While me, the so called Expert is doing his thing, my wife is watching the scene, kind of amused by my efforts. Now of course some of you, who are astute dowsers, will have guessed what my problem is: My dowsing system has no idea what ‘Athena Ley line’ means in terms of feeling, hence no response. I was pacing the walkway back and forth, feeling a bit frustrated. My wife was kind of walking around, facing me. She became very still quite suddenly. I looked at her, sensing a change, I saw some tears in her eyes, and she signaled “Come here”. There is a particular invisible aura when someone is really connected inside and grounded. I sensed that in her, so I came closer. ”What?” she pointed to the ground, “What?” she stayed quiet. So I stopped and stood there, quiet too. One can never really succeed in describing inner feelings, but I must say it felt a bit like opening a bottle of wine. You pull on the cork and nothing happens, then slowly the cork moves, slowly a bit more, then all of a sudden the cork gives in, comes out and opens the wine’s aroma to your delighted senses. So this is ‘sort of’ what happened, but the experience was leading to an inner intoxication, not an outer one. The feeling is only available from one's inner silence, and unless you get there, it will only be a walkway on a medieval castle wall. I do not find reaching this inner state easy, but with concentration, I can do it, and when I do, the feeling which floods me is divine. A couple of tourists passed us by, totally unaware of the happenings. We did find the Apollo line in the same manner, slowly walking over the location, focusing intently, mind empty, receptive, until the “cork popped out”, and what a delight it was then. To visit the original chapel, called ‘Notre Dame Sous la Terre’ (Our Lady Underground) we have to take part in an extensive and costly three hour tour of the Abbey. We finally get to the Chapel with another 50 tourists. The tour guide got really annoyed at my dowsing rods and took personal offence when I said that there was a divine energy there. According to him, it had to come from above, not below… Go figure! The chapel is beautiful, and I could find the exact meeting place of the Ley lines, but it was not easy to be still and focused with all these people looking at me in disapproval. When we came back out, the high tide was starting to cover the car park, so we had to go before our rental car turned into a boat. We could not walk to where the lines enter the mount outside the walls, now deep in the coming high tide. We left happy but knowing we had to come back. On the way back to Paris, we visited several Ley line crossing points, an abbey here, a holy well there, unfortunately too much to describe here. 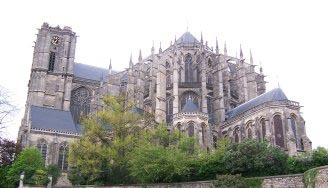 We also wanted to see the Le Mans cathedral. Our first view was impressive, its unique system of Y-shaped flying buttresses making it appear more like a spaceship about to lift off than a structure of heavy stones built by medieval masons. Leaning against the west wall was a truly amazing stone, unlike any we had seen before. It looked alive. Covered in folds as if draped in cloth, it assumed a most powerful presence. We could feel the energy emanating from it which seemed to have discoloured the wall, forming a visual aura around the stone. We arrived too late to enter the cathedral. The doors were closed but we found the Apollo Ley line flowing right into the doors at 45 degree angle. We wanted to find a motel for the night, to be ready to visit the inside of the cathedral the next day. We got lost driving in the suburbs; it was getting late and were tired. Finally we found a motel, got the room key, went up to the room to find it in a mess. So we asked for another room. There was something to this room, but we were tired and went to bed right away. On waking up, I felt something to my right, just outside the bed, like a gentle push on my shoulder. I opened my eyes, wide awake, a gentle thought popped into my mind: “Apollo runs here” the line, a mere foot in width, was running right between the edge of the bed and the wall. It was a soft tangible feeling. We pulled 2 chairs on the line and spent time meditating in total silence and stillness. Totally refreshed we went to visit the cathedral. In 2009 we had a chance to go back to Europe, starting with England. The idea was to visit Hamish Miller’s backyard, South Cornwall. Hamish agreed to meet us. He was great and gave us some good tips, some ordinance maps of South Cornwall and very kindly, a complete set of the Ley lines maps. He had spent more than 10 years of research tracing these lines, while working on the two books mentioned earlier. 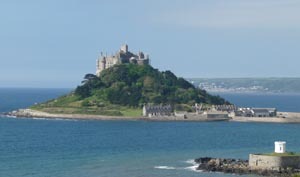 Cornwall has its very own Mount Saint Michael, a small island located opposite the town of Marazion. The island can be reached by a walkway at low tide. Hamish gave us the exact location of the meeting point of the four lines (Michael & Mary and Apollo & Athena) on the mount. This was a real treat. Once on the mount, we had to reach an area forbidden to visitors, jump a fence and follow a small path to the real spot, totally hidden from view. There, we basked in the feeling for hours, forgetting totally about time and tides, in total peace. After what felt like a short time, several hours later in fact, we walked out to find the island closed, the outside gate locked and the tide coming in. We jumped the gate, and ran on the walk way back to shore, just in time not to get wet feet. We started to make some observations. The feeling was getting more familiar, easier to feel, it lingered, a bit like a friend. We also felt a definite change in ourselves. Spending time on the lines has an effect on consciousness. So the pilgrims of the ages had it right, they did not come back home the same as when they left. The lines all the way through France and Italy have supported many saints over the centuries. All of this is outside of any belief system. In the early days before the 11th century and the start of the Crusades, there was a great amount of religious tolerance and everyone had access to holy sites around the known world. Cornwall is a very lovely place and we decided to explore the coastline using the ordinance maps given by Hamish. These maps made a huge difference for us. I had printed some aerial maps of the area using Google Earth, so I felt well prepared. But once on the ground, since we had no idea where we were, the aerial maps were of no use. Thanks to the Ordinance maps, we were able to locate the area where the Carn-Les-Boel stone, marking the last crossing of the Michael & Mary lines, as they leave England for the Atlantic Ocean, was located. A ragged coast, full of mysterious caves, and big stones everywhere. The Carn-Les-Boel stone itself eluded us for a couple of hours, but it was fun walking in the wind swept rocky coast, trying to prevent my dowsing rods to turn into wind vanes. Finally we found the Mary line and followed it to the stone. This rather large stone looks like any other stone in the area, but it is carefully balanced on top of three smaller stones. It felt so good to have found it, after all the walking, through farms, pastures and fields. 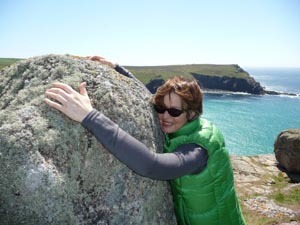 We could not help but hug the stone. Who knows how long ago it was placed in this location and by whom, we wondered. We figured that this stone weighed at least 10 tons, maybe more. If a person could lift 100 kilos, it would take 100 people to lift it into position on the 3 smaller stones. But there is no room around the base of the stone for 100 pairs of hands. This place felt good, then we tried to lie down on the energy line itself, away from the wind, it was real fun. The next point inland was a holy well on the Mary line called Alsia’s well. Again we had placed our hope on the Google aerial maps, but in Cornwall in summer, most roads are covered with vegetation, so it was impossible to see the roads on the photos, even with the assistance of the ordinance maps, we were lost. A kind gentleman pointed us to three steps on the side of the road. It took us ages to discover these three steps, totally hidden under the grass. The steps led us into a field, then another field and finally we could see the metal gate of the well. A very small affair, very cute. Hidden in a hollow was a mini cave filled with clear water seeping from the ground. Someone had placed a small crystal just were the water comes out. A chard of ancient pottery lay in the shallow pool. A very humble place, but filled with sweet energy. On the way out the farmer was waiting for us, a very friendly chap who confirmed that the well was very ancient. He had been to Australia in his younger years and we chatted for a while. You know, sometimes it feels so good to be alive, we felt invigorated again by the energy, like a soft glow. Somehow the sky seemed bluer, the trees greener, people nicer and the air sweeter to breathe. The experience to find this well gave us some feeling for the kind of work Hamish had to do to locate these places. It took us the best part of the day to find Carn-Les-Boel, by the time we left the well, the day was gone. The maps Hamish gave us go all the way to Armagedon in Israel, can you imaging the work involved. It gave us a lot more respect for the achievement. On the other side of the Mount, the Apollo and Athena lines leave England for France. We wanted to sample at least one other crossing point before leaving Cornwall. 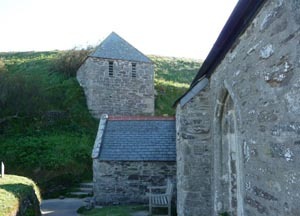 We selected a small church called Gunwalloe. Hamish found that the energy inside the tower formed an energy field in the form a of a four–petalled flower shape, similar to a Maltese Cross with rounded edges, around the point where the energies of Apollo and Athena buried themselves deep into the ground. The diameter was about 8 feet, with 7 inch gap between the petals. The tower was aligned with the arms of the cross formed by the energy lines, not to the cardinal points. 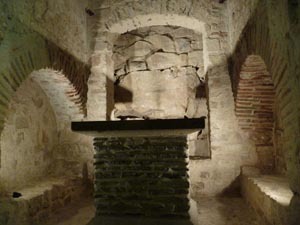 The Athena line also crosses the altar inside the church at 45 degrees, meeting with a water line, right on the altar. On the other side of the church, the energy continues towards an old stone cross looking a bit strange. We found dozens of snails had lodged themselves in the hollows of the cross. Do snails feel the energy too or were they very religious snails? 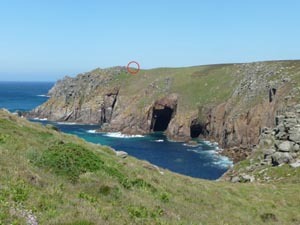 Hamish also says that “Many people have reported curious experience at Gunwalloe, for it appears to be one of these places that is rich with otherworldly glimpses”. After England, we flew to France as we had to re-visit Mont Saint Michel in Brittany, and I am so glad we did. This time we had very precise maps of the energy locations. Coincidently, the high tide was very low due to the phase of the moon, allowing us to walk around the mount and look at the entry points of the Ley lines. We also wanted to see again the original chapel built by Saint Auber. 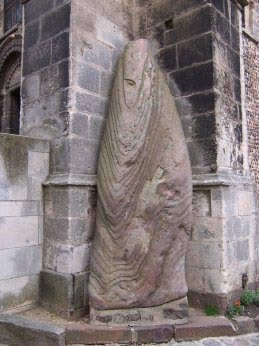 The original monk eventually became the archbishop of Avranches, a holy saint (pun intended), before his skull graced his own church. We asked to visit the chapel Our Lady Underground, but were told it was impossible until the weekend. When I mentioned that we came all the way from Australia to see it, a kind lady tour guide took upon herself to take us there. Armed with a key about a foot long, she took the two of us down the dark corridors under the cathedral. This time, we were alone with the energy and this very friendly lady. We did have the time to enjoy the amazing feeling, look around and explore. Each line enters the rock face through a separate altar. We noted the dedication of each altar, on the Athena line, dedicated to Mary, on the Apollo line dedicated to Archangel Michael. The two lines actually meet inside the rock. Then we both just stood there, on the path of each line, silent, still and elated. After a while, this pricked the lady’s curiosity. She asked what we were doing. We told her about the Ley lines, as lines of divine energy linking human consciousness to the divine plane. She asked if she could feel it too, I said “Sure, come over here”. She moved over the line and stood silent for a while. After a while she just said “Now I know why I am a guide here, I always wondered why” I did not ask what she meant, or what she felt. It was glad enough she felt something. This time we could not leave. 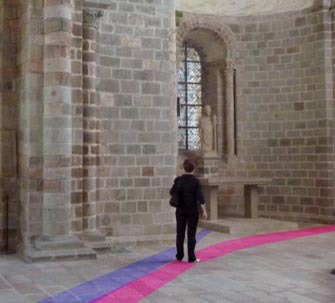 We walked on the line everywhere we could, outside on the sand, above the chapel in the cathedral where the exact meeting point of the lines can be reached, walking surreptitiously over the line, slowly, back and forth, yet always focused inside. An observer would have never guessed where our focus was. Leaving was hard, we even walked on the line in the parking lot, going back to the car. I am sure we could have detected some subtle differences between each line, and maybe other colour harmonics, but documenting this will be for next time. These 3 energy qualities are to be found at all holy sites. We did verify that they were present at all the line crossings we visited. They are said to be highly beneficial to humans and consciousness enhancing. How were these measurements made? I used the Virtual Cone pendulum, invented by the French Scientists Chaumery & De Belizal in the 1950s. This pendulum can be set to detect any of the 12 energy quality bands. It can differentiate between the Horizontal wave (beneficial) and the Vertical wave (detrimental) of each band. The energy quality bands have been given the names of colours. They are not colours, although they resonate with the colour of the same name. The author can be reached by email (by clicking here) if you wish to organize a viewing of the ‘Exploring the Ley Lines of Europe’ presentation, or ask any questions.